When a Peoples worker stops by to work on your gas line or light any appliances, ALWAYS ask to see identification. You should feel safe and comfortable before we enter your home. If you have any questions or concerns, call our Customer Service Center right away at 1-800-764-0111. Below you'll find a list of practical do's and don'ts when dealing with natural gas. Smell a sulfur-like, rotten egg odor? DO leave the area and call our emergency number at 1-800-400-4271 or dial 911 immediately. See a line of brown, dry grass (in an otherwise moist area)? DO call our emergency number at 1-800-400-4271. DO keep the area around your gas meter clear of debris. DO check all of your outdoor appliance exhausts year round to make sure they are clear. DO install a carbon monoxide detector, and make sure to regularly test it. DO ask to see ID when a Peoples worker stops by to service your gas line or any appliances. 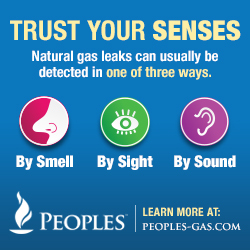 If you smell natural gas, or if you hear or see signs of a gas leak, DO NOT attept to find the leak yourself. Instead, leave the area immediately and call our emergency number1-800-400-4271 or 911. DO NOT open your windows if you smell natural gas in your home! Natural gas is combustible only when it makes up 5-15% of the air in a given space. By opening a window, you might actually make the area more unsafe. DO NOT turn on/off any lights or appliances if you smell natural gas in your home or building. DO NOT store flammable products in the same room/area as your furnace. DO NOT keep combustible material or debris around or near your furnace. You should have a clear space around your furnace at all times. DO NOT go near an area that has a sulfur-like, rotten egg odor. DO NOT use your weed-whacker or lawn mower too close to your gas meter. DO NOT tie your dog to your gas meter. DO NOT uproot any trees or shrubs before calling 811. If you do plan on uprooting and trees or shrubs around your gas meter, please call Peoples first to make sure it is safe. Roots can easily become entangled with natural gas pipelines. If you smell gas or suspect a leak, leave the area and call the 24-hour emergency number for Peoples at 1-800-400-4271 or dial 911 for help.